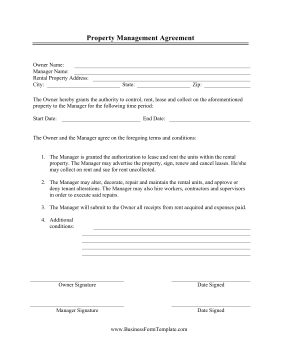 The owner of a rental unit, house or apartment in this free, printable contract agrees to certain conditions allowing a manger to lease, rent, maintain and alter the unit in question. It must be filled out and signed by both parties. The Manager is granted the authorization to lease and rent the units within the rental property. The Manager may advertise the property, sign, renew and cancel leases. He/she may collect on rent and sue for rent uncollected. The Manager may alter, decorate, repair and maintain the rental units, and approve or deny tenant alterations. The Manager may also hire workers, contractors and supervisors in order to execute said repairs. The Manager will submit to the Owner all receipts from rent acquired and expenses paid.